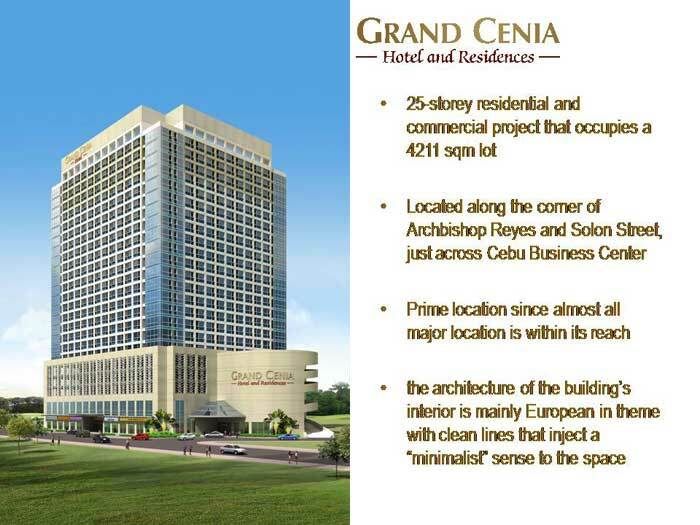 Grand Cenia Hotel and Residences is a 25-storey hotel and residential tower that will rise along Archbishop Reyes, corner Solon Street, Banilad, Cebu City. 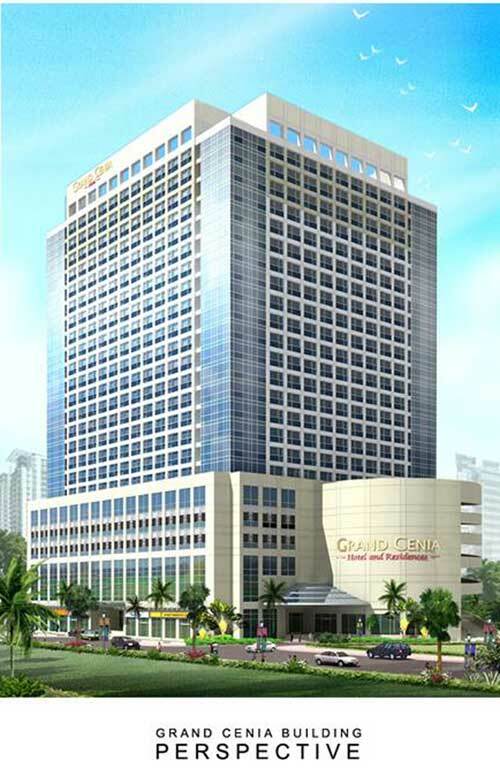 It will be situated on a 4,211-sqm property strategically located within the Cebu Central Business District. 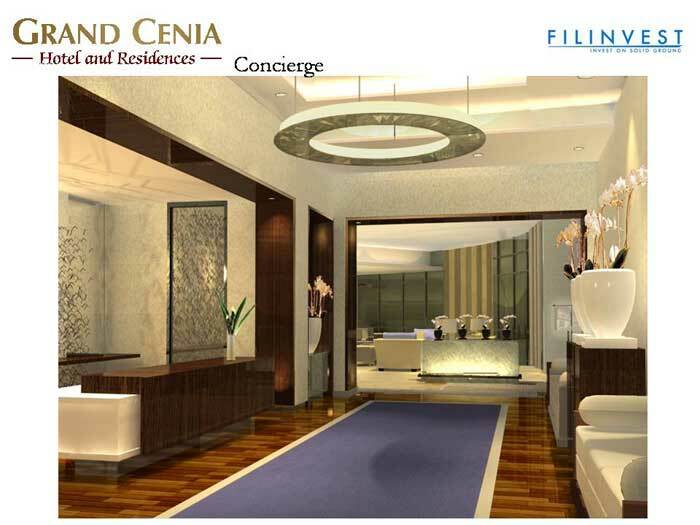 Grand Cenia Hotel and Residences was conceptualized in response to the flourishing hotel industry in Cebu. From year 2006 performance alone, all the major hotels (three star class and up) in Cebu experienced a very high, year-round occupancy rate. Conventions, both national and international, are being held in Cebu regularly. Together with the increasing tourism patronage from locals, OFWs, and foreigners, there will be a big shortage of supply for the hotel industry in Cebu as it plays catch up to address the growing demand for hotel rooms in the next 3 to 5 years. 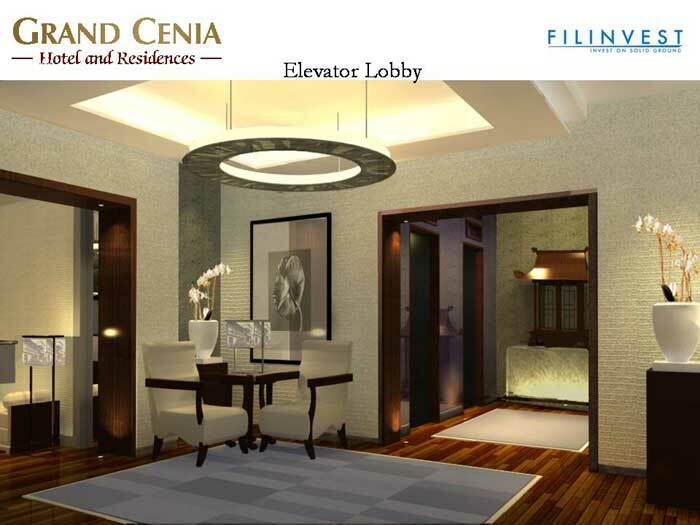 True to the essence of its name, Grand Cenia seeks to attract people who have gone places and are going places. The condotel product mostly hopes to attract the market segment that have needs for temporary living spaces whenever they visit Cebu, whether for business or pleasure, and an investment tool that earns for them when not in use. 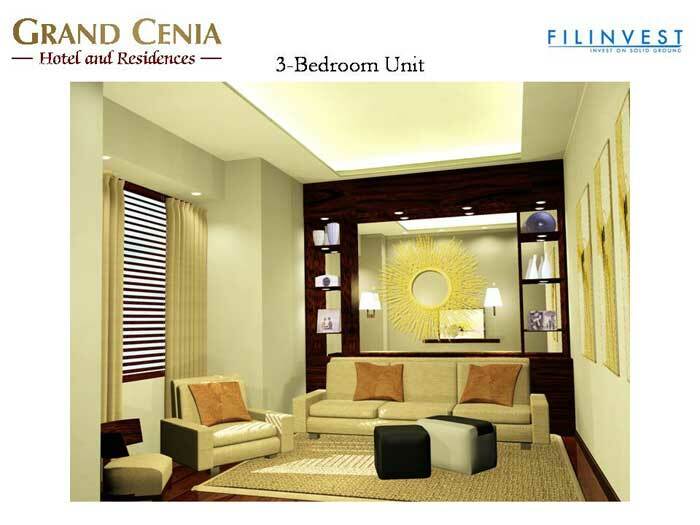 The residential condominium products mostly hopes to attract the end-user market segment who may have longer term living space requirements, whether they have chosen to make Cebu their home or they need to set up base in the economic and academic hub that is Cebu. There will be 11 floors initially allocated as condotel floors, later to be used for hotel operations (from the 7th to the 18th floor). These floors will feature the studio type condotel units. The 7th floor will serve as the main amenity floor, where the swimming pool, kiddie pool, swimming pool deck, landscaped area and function rooms / hotel coffee shop are located. 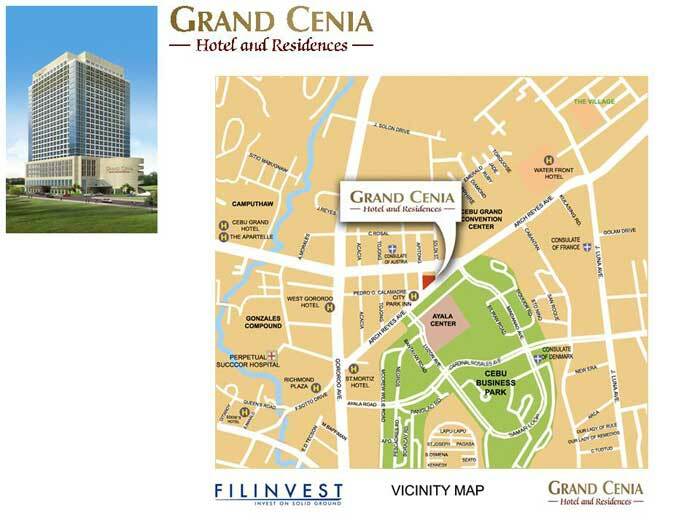 These facilities will be for the use of both the hotel guests and the residential condominium unit owners. There will also be condotel units on the 7th floor - condotel units with bigger saleable area as they are provided with open patios to better appreciate the pool deck and landscaped area. There will be 7 floors initially allocated for residential condominium units - from the 19th to the 25th floor. These floors will feature 1BR, 2BR and 3BR units. 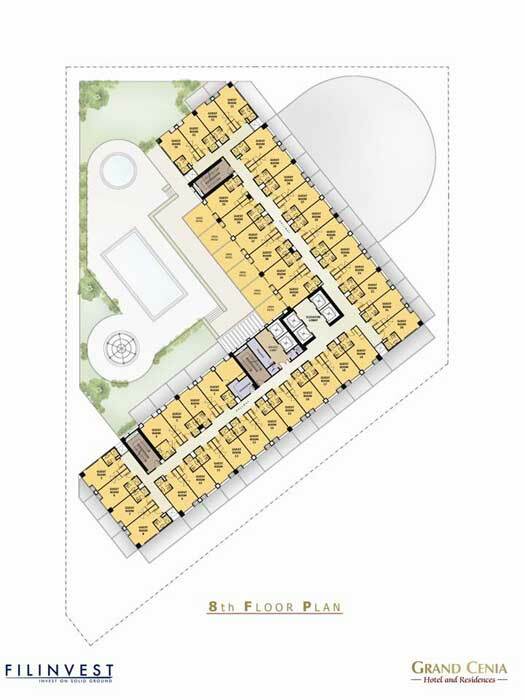 The 1-bedroom units have a standard size of 49.98 sqm. The unit has a dining area, a living and receiving area, a kitchen, and a main bedroom with its own privately accessed toilet and bath. The building offers 63 1-bedroom units. 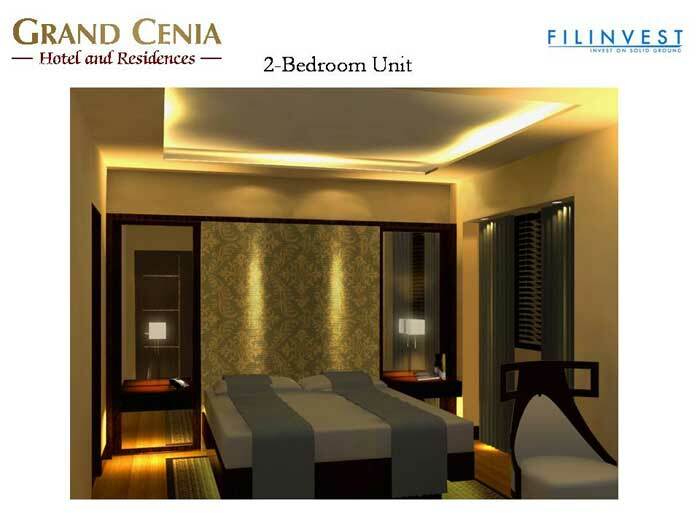 The 2-bedroom units have a standard size of 74.97 sqm. It has a master’s bedroom with its own toilet and bath. Aside from another bedroom, the unit also has a dining area, a kitchen, a living and receiving area, a utility/maid’s room and a communal toilet. The building offers 35 2-bedroom units. 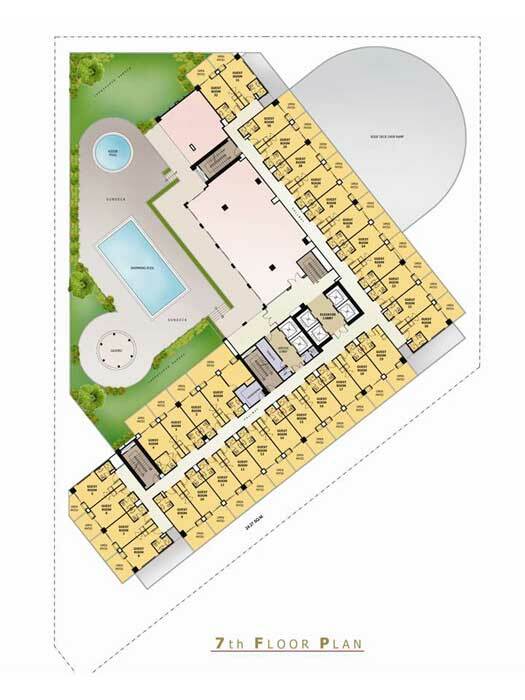 The 3-bedroom units have a standard size of 107.35 sqm. It has a dining area, a kitchen, a living and receiving area, a utility/maid’s room, one regular bedroom, a 2nd bedroom with its own toilet and bath, and a master’s bedroom with its own toilet and bath and a walk-in closet. The building offers 14 3-bedroom units. All types of units are configured in a way that will give the living and receiving area and all the bedrooms full advantage of the view that their unit windows offer. Depending on the location of their unit on the floor layout, their views would range from a panoramic view of the Cebu Business Park, the surrounding mountains and the amenity area. Residential condominium units are delivered with these finishes: painted plain cement plaster walls, painted smooth rubbed concrete ceilings, high quality vinyl floor tiles with simulated wood design, painted steel windows and frames, standard bathroom fixtures, solid wood panel doors for the main entrance, flush wood doors for the bedrooms, rigid PVC doors for the toilet and bath, pre-fabricated kitchen counters and cabinets, hot water provision, grease trap, provision for window type air-conditioning units, exhaust fans, exhaust ducts, intercom system, independent telephone lines, fire protection and fire alarm system. All the residential condominium units are also sold with specific pre-identified parking units located either on the 4th, 5th or 6th floor of the building. At the pre-selling stage, there is not much difference in the procedure for buying a residential condominium unit from a condotel unit. In buying a condominium or condotel unit, the buyer should first provide the Developer with a letter stating that he/she is offering to buy the said property. Afterwards, the buyer must then furnish the Developer with all the needed documents, including the Rental Pool Agreement and pay the reservation fee of Php50,000.00, the 20% of the TCP as down payment or 90% of the TCP depending on the financing plan that he chooses. 12 months before turnover, condotel unit buyers must also pay the Rental Pool Joining Fee amounting to Php280,000-300,000. The fee includes all the furnishing costs for the unit to make it hotel room standard and the Rental Pool membership fee. The rental pool membership fee would also advance 3 months’ operating expenses to jumpstart hotel operations, and also cover initial hotel capital expenditure. However, the condotel unit buyer must be aware of the conditions for buying a condotel unit enumerated in the Rental Pool Agreement. Any prospective buyer must be willing to subject their units to the provisions outline in the Agreement. 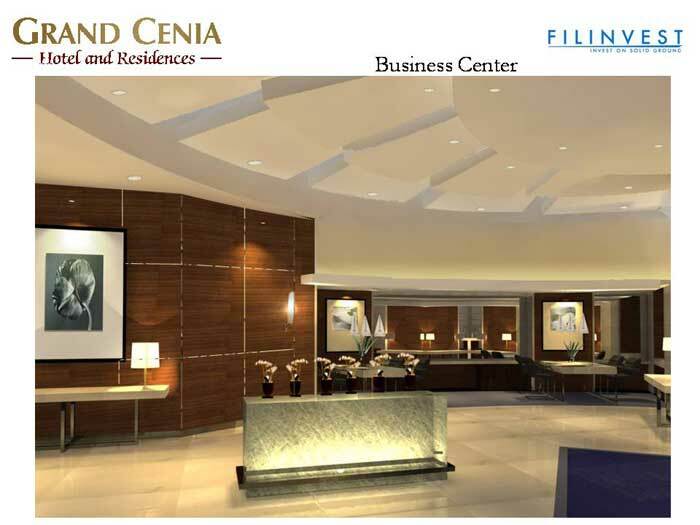 We offer the cash and deferred cash payment terms for both the condotel and condominium units. 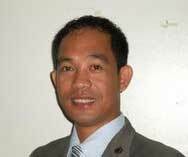 We also offer 20%-30%-50% 3-stage installment payment term for the condominium units. 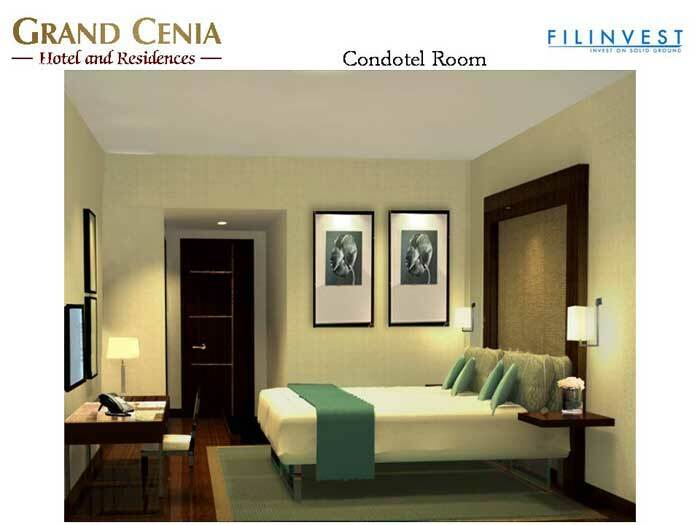 A Php50,000 reservation fee is required for both the condotel and the condominium purchase. For cash payment, a 10% discount is offered, with 90% of the contract price payable in 30 days from reservation. The remaining 10% of the contract price will be payable upon turnover. For the deferred cash payment, 100% of the contract price will be spread over 36 equal monthly payments. For the 20%-30%-50% installment, a 6% finance charge will be applied on the contract price. 20% of the contract price is due 30 days after reservation, 30% payable for the next 36 months after and the remaining 50% of the contract price payable upon unit turnover. 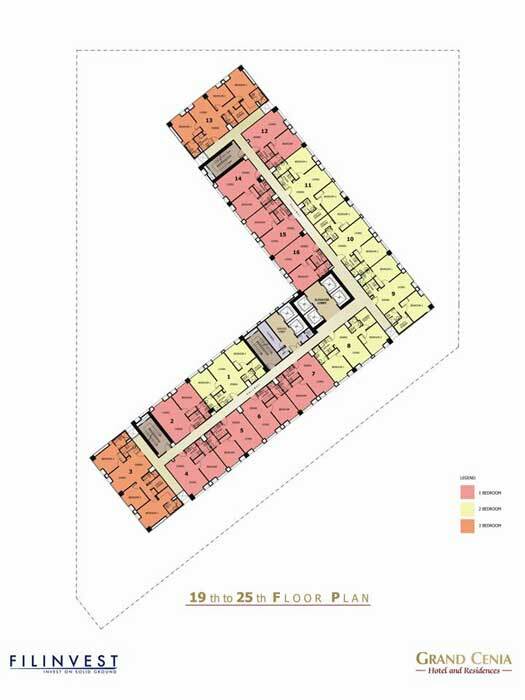 For condominium units, one (1) parking slot is already allocated for each unit. The price for the parking slot is already included in the condominium unit’s TCP. For condotel units, the parking spaces are retained as a condotel common area to cater to the hotel guests. Parking would definitely not be a problem since the hotel will provide valet services for the guests. The joining fee would have to be fully paid 12 months before turnover of the condotel unit to the owner. The condotel unit owner could opt to pay for the joining fee in cash or arrange an amortization scheme with the developer starting two years before turnover. 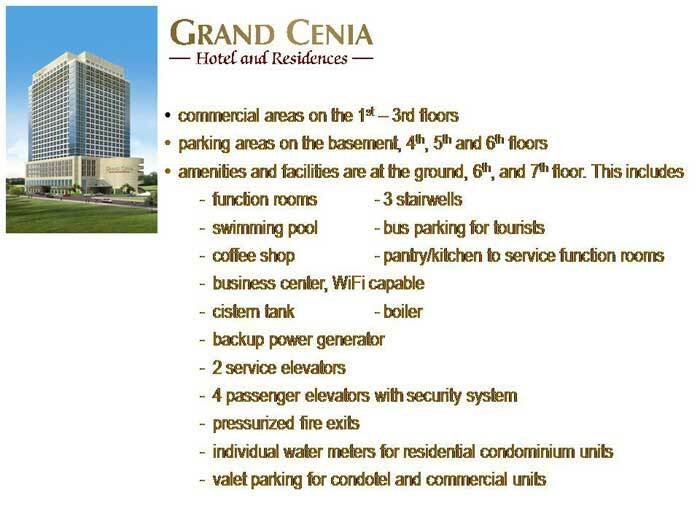 Unit owners at the Grand Cenia Hotel and Residences are required to pay Condominium Association dues on a monthly basis. For the Condotel owners, the amount of the Condominium Association dues shall be deducted from their share of the Rental Pool income and be turned over by the hotel operator to the Condominium Corporation. Corresponding taxes would also have to be paid.